TALLAHASSEE, FL—Noting the increasingly animated choreography and behavior of the characters on stage, sources at the Tallahassee Community Theatre reported Friday that this is apparently the kind of musical with a big number about putting on a show. The first indication that the production would include a high-energy song-and-dance performance about staging a show reportedly surfaced when a schoolchild rushed onto the bustling Main Street set and announced that a play was going to take place, setting off a round of progressively more rhythmic chattering as the town’s residents discussed who would play what roles. 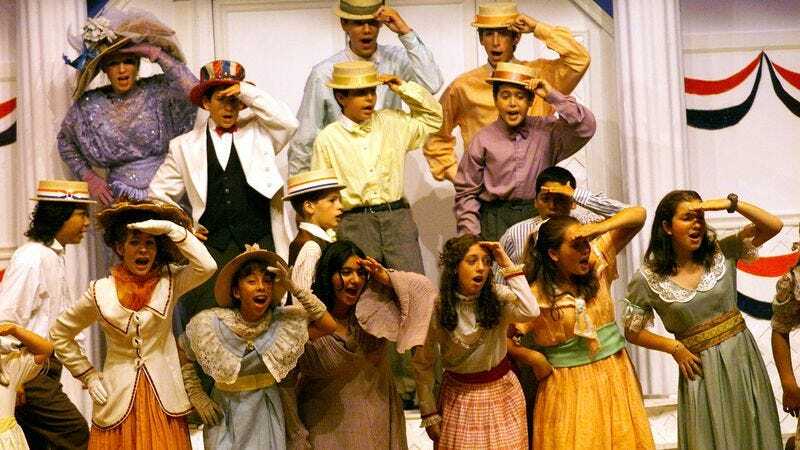 According to those in attendance, a group of the town’s biggest gossips immediately indicated that they would play the chorus in the production, while a pair of handymen holding ladders twirled across the stage and volunteered to build the sets. Sources stated that at this point, a boisterous debate began as all assembled argued over who would play the star, a question which was only settled when the town’s beautiful-but-shy schoolteacher happened to step out of the schoolhouse and onto center stage moments after another character had loudly proclaimed that the perfect lead actress wasn’t “just going to walk right out from behind that door.” At press time, those with knowledge of the situation reported that all the townspeople had excitedly danced off stage to prepare for the play, leaving behind only the irascible old shopkeeper, who comically chided the rest of the town for “getting worked up over some nonsense” and resumed sweeping while absentmindedly whistling the tune that had just been performed.